The ability of immunohistochemical studies to distinguish benign from malignant phyllodes tumors have been questioned in this study, through evaluating the stromal CD10 expression in different grades of breast phyllodes tumors. This is a preliminary study that consisted of the paraffin blocks of 34 Egyptian female cases of phyllodes tumors of different grades. Depending on the criteria described in the previous section, benign phyllodes tumors were classified when there was no extensive stromal overgrowth, mitotic figures were 2 or less per 10 high power fields, well circumscribed border and absence of nuclear pleomorphism [Figure 1]. On the other hand, malignant phyllodes tumors were diagnosed when they showed extensive stromal overgrowth, 5 or more mitotic figures per 10 high power fields, infiltrating border and marked nuclear pleomorphism [Figure 2]. Borderline phyllodes tumors were more atypical than the benign but did not fulfill all the criteria of malignancy. Each paraffin block was recut by rotatory microtome at 4 mm thickness then mounted on glass slides to be stained by hematoxylin and eosin (H and E) for routine histopathological examination and on charged slides for immunostaining using standard immunoperoxidase method. 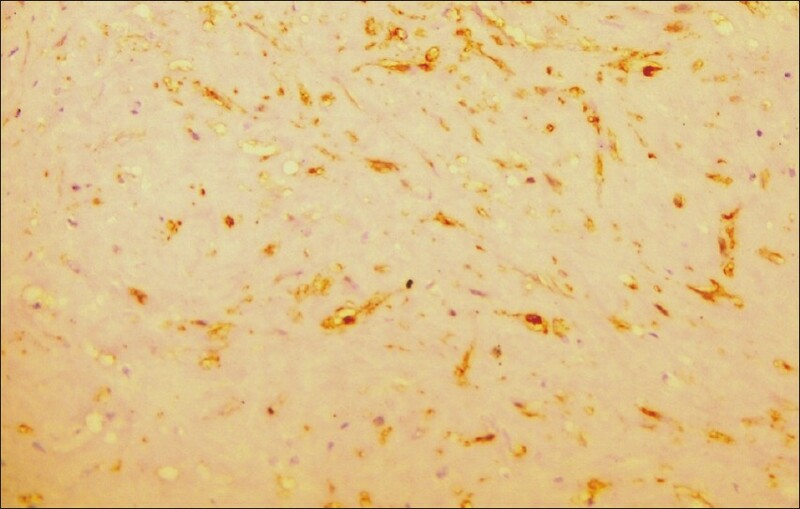 For the assessment of CD10 expression, a representative slide from each case was stained using an antibody against CD10 (CD10/CALLA, Ab-2, mouse monoclonal, antibody, clone 56C6, dilution 1:50). As positive control for cases stained for CD10, a section of tonsil was employed. 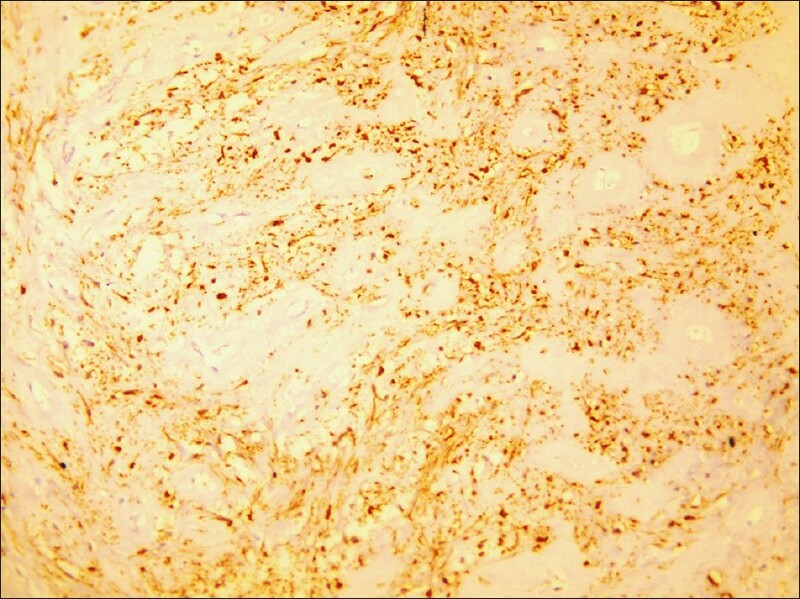 Every section was carefully examined at power magnification (×100) for the presence of tumor stromal immunostaining using Olympus microscope CX21. The Chi-square test was used to determine differences in CD10 expression between benign, borderline and malignant tumors. One-way ANOVA test was used to determine whether the difference was significant. Significance was established at P<0.05. Data was collected, coded, and analyzed by SPSS software version (9) under window XP. This study included 34 cases of phyllodes tumors classified as 24 cases of benign phyllodes tumors (70.6%), 5 cases of borderline phyllodes tumors (14.7%) and 5 cases of malignant phyllodes tumors (14.7%). The patients' ages ranged from 17 years up to 65 years and the tumor sizes ranged from 2 cm up to 31 cm in maximal diameters. In the 24 cases of benign phyllodes tumors, the patients' ages ranged from 17 years up to 55 years (mean 32.5 ± 10.7) and the tumor sizes ranged from 2 cm up to 8 cm in maximal diameters (mean 2.8 ± 1.3). In the five cases of borderline phyllodes tumors, the patients' ages ranged from 37 years up to 65 years (mean 49.2 ± 12.1) and the tumor sizes ranged from 5 cm up to 15.5 cm in maximal diameters (mean 8.1 ± 4.4). As for the remaining five cases of malignant phyllodes tumors the patients' ages ranged from 35 year up to 63 years (mean 50.2 ± 11.6) and the tumors sizes ranged from 9 cm up to 31 cm in maximal diameters (mean 16 ± 8.8). These results showed highly significant correlation between the patients' ages (P=0.0001) and the tumor sizes (P=0.005) on one hand and the tumor grade on the other hand. These results were summarized in [Table 1] and [Table 2], respectively. Another highly significant correlation was found between CD10 expression and the tumor grade (P=0.0001). In cases of benign phyllodes tumors, only four cases (16.7%) showed positive CD10 reactivity, distributed as three (12.5%) weakly stained and only one (4.2%) strongly stained, while 20 cases were negatively stained for CD10 (83.3%). Three (60%) of the borderline phyllodes tumors showed positive CD10 reactivity, distributed as two (40%) weakly stained [Figure 3] and only one (20%) strongly stained, while the remaining two (40%) showed negative CD10 staining. As for cases of malignant phyllodes tumors, the majority of cases showed positive CD10 staining constituting four cases (80%), distributed as only one (20%) weakly stained case and three (60%) strongly stained cases [Figure 4], while the remaining one (20%) was CD10 negative. These results were summarized in [Table 3]. Reports on CD10 expression in the breast are scarce, but it has been reported in different other cell types. One of the few studies done on CD10 expression in breast tumors, was that conducted by Tse et al., showing the same conclusion as this current study. Their study consisted of 102 benign phyllodes tumors showing 96% negative staining and only 5.9% positive CD10 reactivity, 51 cases of borderline phyllodes tumors showing 68.6% negative staining and 31.4% positive CD10 immunoreactivity and 28 malignant phyllodes tumors showing 50% positive and 50% negative CD10 staining. These results showed high significance. In another small series study done by Mechtersheimer et al., three benign phyllodes tumors were studied showing weak CD10 staining, while the only malignant phyllodes tumor case conducted showed very intense staining. This study faced some problems, one of them was that the results were based upon data obtained archives which are not so optimal, leading to a small number of cases. Another limitation in this study is the lack of patient follow up to determine their exact outcome including complete recovery or recurrences. Our hospital lacks computerized data base about the patients, so we cannot track patients with recurrence. This study suggests that CD10 expression is higher in borderline and malignant phyllodes tumors. This could be an important observation that may have both diagnostic and prognostic implications as well as promising potential target for development of novel therapies, a subject for further investigations. 1. Margaret IL, Bhuvaneswari R, Cynthia CP, Michael TM, Gayle G, Gerard JN, et al. Giant breast tumors: Surgical management of phyllodes tumors, potential for reconstructive surgery and a review of literature. World J Surg Oncol 2008;6:117. 2. Kapali AS, Singh M, Deo SV, Shukla NK, Dillip KM. Aggressive palliative surgery in metastatic phyllodes tumor: Impact on quality of life. Indian J Palliat Care 2010;16:101-4. 3. 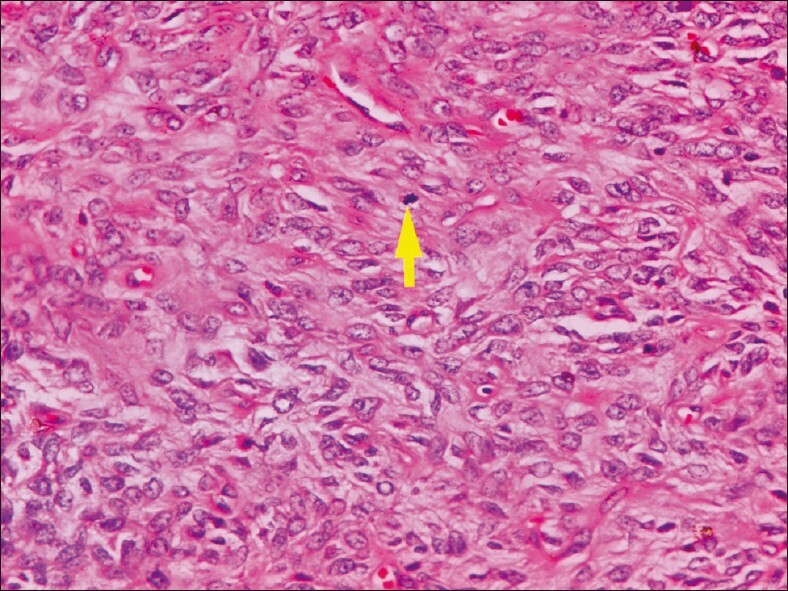 Abdul Aziz M, Sullivan F, Kerin MJ, Callagy G. Malignant phyllodes tumor with liposarcomatous differentiation, invasive tubular carcinoma, and ductal and lobular carcinoma in situ: Case report and review of the literature. Patholog Res Int 2010;2010:501274. 4. Tse GM, Tsang AK, Putti TC, Scolyer RA, Lui PC, Law BK, et al. Stromal CD10 expression in mammary fibroadenomas and phyllodes tumors. J Clin Pathol 2005;58:185-9. 5. Nikita AM, Malcolm H, Beverley AC, Shahriar D, Gilks CB, David GH. Stromal CD10 expression in invasive breast carcinoma correlates with poor prognosis, estrogen receptor negativity, and high grade. Mod Pathol 2007;20:84-9. 6. Mokhtar N, Gouda E, Adel E. Breast cancer in cancer pathology registry 2003-2004 and time trend analysis. Latest ed. Cairo: Sanofi Aventis; 2007. 7. Parker SJ, Harries SA. Phyllodes tumors. Postgrad Med J 2001;77:4208-35. 8. Mechtersheimer G, Kruger KH, Born IA. 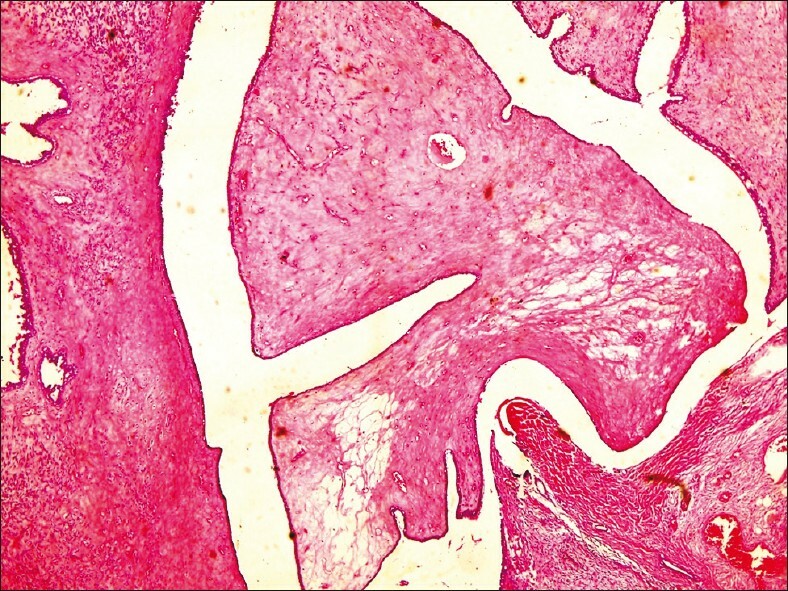 Antigenic profile of mammary fibroadenoma and cystosarcoma phyllodes. A study using antibodies to estrogen and progesterone receptors and to a panel of cell surface molecules. Pathol Res Pract 1990;186:427-38.